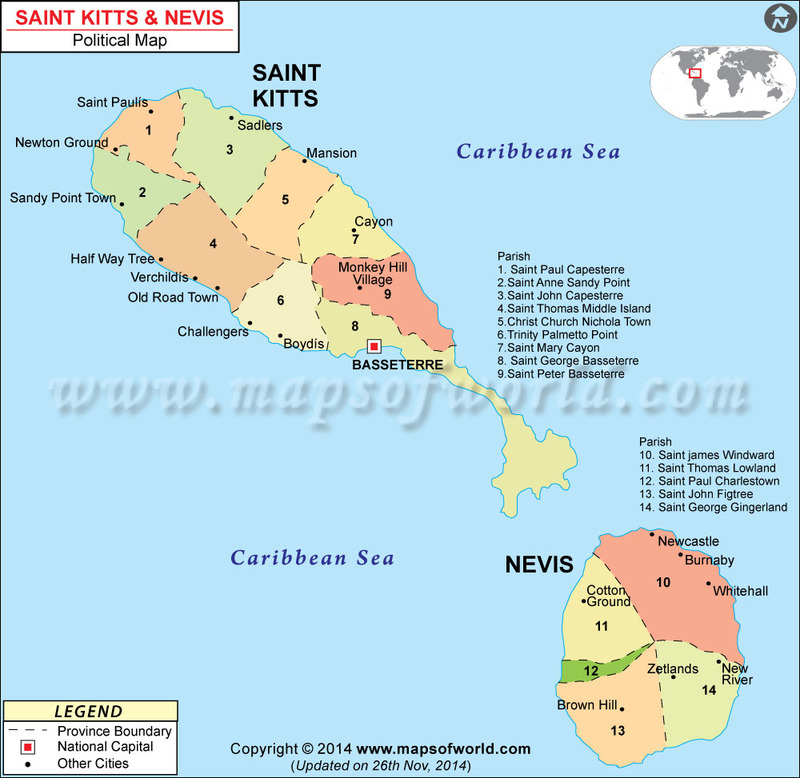 St Kitts and Nevis encompasses total area of 261 sq km. and Nevis were the Kalinago, who arrived from the Americas around 1300 AD. They called the island Liamuga, meaning “fertile land” because the islands were created by a hotspot volcano, leaving rich soils. Nevis was known as Oualie, meaning “land of beautiful waters.” The Kalinago people quickly took over much of the territory in the Caribbean islands. Europeans arrived in the area around 1493, with the second voyage of Christopher Columbus for Spain, and the island earned the name Saint Christopher, while Nevis was soon named Nuestra Señora de las Nieves (or Our Lady of the Snows) which was shortened to Nevis. In 1623, the island of Saint Kitts was colonized by English explorer Sir Thomas Warner as the first English settlement in the Caribbean. The French arrived and settled on the island as well in 1625. The Kalinago people planned a revolt, but the colonists heard the plans and attacked the natives first, resulting in the massacre of thousands of Kalinago in what is known as the Kalinago Genocide of 1626. After the battle, the English and French took full control of the islands and continued their expansion to other islands. Settlers from Saint Kitts expanded to Nevis in 1628, growing tobacco on the island. Tobacco became a cash crop on the islands, followed by sugar cane in 1640, and slaves were soon imported from Africa to handle the labor. The French and English colonists on the islands fought their own war while their home countries battled, resulting in the French gaining temporary control of the island for two years beginning in 1665. The French took over yet again in 1689, and pushed the English off the island. In 1690, a large earthquake caused severe damage to the island of Nevis. With the Treaty of Utrecht in 1713, Saint Kitts was ceded by France and became part of the United Kingdom of Great Britain. In 1871, all of the Leeward Islands became the Federal Colony of the Leeward Islands, followed by the unification of governments of Saint Kitts, Nevis, and Anguilla. In 1962, these three islands became its own state, called Saint Christopher-Nevis-Anguilla. Shortly after, they became an associated British state. Anguilla seceded from the union in 1971. Saint Kitts and Nevis share no land boundaries with other nations, but other islands include Puerto Rico and Trinidad and Tobago. Saint Kitts and Nevis are situated in the Leeward Islands in the West Indies, which are located in the Caribbean Sea. Two islands make up the country of Saint Kitts and Nevis. The larger island is called Saint Christopher or Saint Kitts, while the smaller island, located about 3 kilometers (2 miles) southeast of the large island, is called Nevis. Saint Kitts is an oblong island, while Nevis is mostly circular. The islands were created by volcanic activity, and as such they are formed of volcanic rock with rich fertile soils. The islands are the peaks of oceanic mountain ranges in the Caribbean. The islands are mountainous, with their highest point at Mount Liamuiga, a dormant volcano that stands 1,156 meters (3,792 feet) above sea level. On Nevis, the main peak is Nevis Peak, which stands 985 meters (3,232 feet) above sea level. Intermittent rivers flow down the mountains, which supply fresh water to the islands. The Cayon and Wingfield rivers are the only permanent rivers on these islands. Basseterre, the capital, features colonial architecture, including its Old Treasury building and National Museum, as well as St. George's Anglican Church. Remnants from the days of plantations and slave labor still lie in ruins around the islands. One major site on the islands is Brimstone Hill Fortress, which is a UNESCO World Heritage Site for its preserved fortress. It is also part of a national park. Another scenic destination is Mount Liamuiga, which is a dormant volcano and makes a good hike with stunning views. Flights are available into both Saint Kitts and Nevis, with Bradshaw International Airport in Basseterre on Saint Kitts, and Amory International in Charlestown, Nevis. The main destinations served by these airports include Puerto Rico, Miami, Britain, and Canada. As an island nation, boats are another popular way to visit the country. There are many cruise lines offering trips to Saint Kitts and Nevis, while charter boats and ferries can also be arranged. To get around the islands, there are many taxis and buses available, as well as a scenic railroad tour, which offers visits to the old sugar cane fields. The National flag of St. Kitts and Nevis was acquired on 19 th September, year 1983.The flag with 2:3 proportions is comprised with three crosswise strips. Major ReligionThe people of St. Kitts and Nevis are devoutly religious. Several historic Anglican churches remain on Nevis, and fifty percent of the country's population still practices the religion. Most other people belong to another Christianity denomination, though there are some Rastafarians and Bah' followers.